Learn how to easily unlock iPhone or iPad hit by the helpappledevice@gmail.com mobile ransomware that tries to dupe victims into submitting $50 as a ransom. When security researchers reverse engineer an arbitrary piece of commonplace ransomware, they dissect its code in a bid to identify weak links and thus unlock the device or decrypt the personal data stored on it. 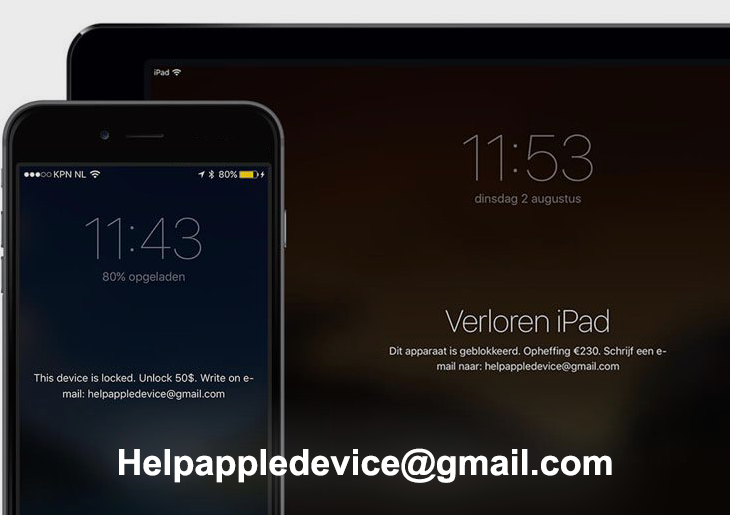 In the case of the so-called helpappledevice@gmail.com attack on iPhone or iPad, things are entirely different. On the one hand, the incident does look like a ransomware breach, with such attributes as the warning message and payment demands in place. On the other, it turns out that there is absolutely no malicious code running on the gadget. Instead, the threat actors somehow get access to one’s Apple ID and password and use these details to activate the feature called “Find My iPhone” via the victim’s iCloud account. This is generally a useful functionality that’s meant to help Apple customers locate their lost or misplaced device. In this scenario, though, the offenders take advantage of this option to lock the phone and even set up a custom warning message other than the default “This iPhone has been lost. Please call me”, followed by the owner’s phone number. The rogue alert says, “The device is locked. Unlock 50$. Write on e-mail: helpappledevice@gmail.com”. The victim, obviously, is told to contact the perpetrator over email and get a response with instructions on how exactly to pay the $50 fee for the unlocking. Although this looks like a serious predicament at first sight, there is so much bluff behind it. The only thing that’s real is the fact that the attacker managed to get hold of many users’ Apple IDs and other iCloud credentials. It’s likely that there was a massive dump of this information recently somewhere on the dark net. Furthermore, the infected users’ passwords were reportedly weak, which may have also become a springboard for deploying a con like this. Once the malefactor has these details, they can safely log into the target’s iCloud account, go to the “Find My iPhone” app, enter a message that will be shown on the lock screen, and activate the feature. Therefore, this is a data breach issue rather than an actual ransomware assault. There is no bad application running on the iPhone – it’s just a social engineering attempt to persuade the victim otherwise. Fortunately, it shouldn’t take a rocket scientist to circumvent this lock. The first thing that a user should try is simply tap the unlock option at the bottom of the screen and enter their regular passcode set on the device. If this doesn’t help, be sure to follow the instructions below. Also, be sure to use strong passwords for your sensitive accounts and consider setting up two-factor authentication. • Use the new password to regain access to your iPhone or iPad. Infections like the helpappledevice@gmail.com locker can obtain your sensitive credentials through unprotected connections. Logging into public Wi-Fi networks and visiting compromised sites can get the gadget exposed to malware and man-in-the-middle attacks. It’s therefore strongly recommended to use automatic protection during web surfing.